The mental health of children and adolescents has suddenly become a cause of concern in India -- with good reason. Abhineet Kumar reports. 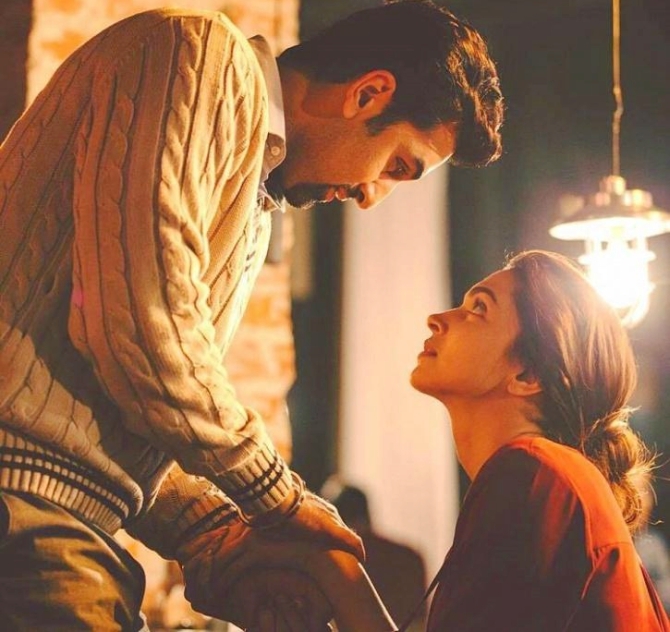 Ranbir Kapoor and Deepika Padukone in Tasmasha, a film that addresses the issue of mental health. Padukone has also spoken about her personal struggle with depression, lifts the cloak of secrecy shrouding the subject another important inch. Zirak Marker's days have been particularly hectic of late. The task at hand for the child and adolescent psychiatrist: calming panicky parents after cases of adolescent suicides in India were linked to the now infamous Blue Whale Challenge. For any of us who may have been living in a cave the past few months, the Challenge is a virtual 'suicide game' where the player is given various tasks by an administrator over a 50-day period, ranging from isolation to self-harm to ultimately suicide. It has allegedly claimed over 100 lives worldwide. Suicide can, of course, be seen as the ultimate manifestation of emotional maladjustment. And the statistics are frightening: the World Health Organization estimates that, globally, close to 800,000 deaths owe to suicide every year -- this is one person every 40 seconds. Thus, parental anxiety about a freely available online 'game' that guides a child or adolescent to suicide is understandable -- but is, if you agree with Marker, perhaps misplaced. He has a broader perspective on the affair. 'If you look at the number of suicides that allegedly took place because of the Blue Whale Challenge, it is minuscule against the number of youngsters who harm themselves every day,' says Marker, who is also medical director at the Neerja Birla-headed mental health centre, Mpower, in Mumbai. His point is that the mental health challenges that confront us are far greater, and far more varied, than the knee-jerk parental anxiety about Blue Whale-related suicides indicate. Government estimates are that 6-7 per cent of the Indian population as a whole lives with major to minor mental health concerns -- from the downright debilitating to the definitely disturbing, and everything in between. The number points to approximately 70 million afflicted Indians, and this number is increasing every year. And since government assessments of problem situations are frequently ostrich-like and less than adequately informed, one can safely assume that the scale of the problem on the ground is far greater. The World Mental Health Day is an appropriate occasion for mental health practitioners to turn the spotlight on one of the most vulnerable -- and least observed -- groups: children and adolescents. Worldwide, anything between 10 and 20 per cent of children, adolescents and young adults have been diagnosed as suffering from mental disorders. Half of all mental illnesses begin by the age of 14 and three-quarters by the mid-20s. In adolescents (13-18 years), the commonest problems are anxiety including social anxiety, phobias, adjustment disorders, depression, and increased substance abuse. In the younger age group, neuro-developmental disorders such as ADHD (Attention Deficit Hyperactivity Disorder) and autism, behavioural problems and learning difficulties are more common. According to Marker, some risk factors for these mental problems in the youth include bullying, low self-esteem, lack of parental involvement, peer pressure and academic failure. The Mpower Centre and Mpower Foundation were founded in Mumbai by the wife of industrialist Kumar Mangalam Birla, Neerja Birla, about two years ago to create awareness about mental health challenges in the country, especially among the youth. She started a unique initiative in October by organising India's first student-led inter-school mental health festival, 'The Happy Place'. The event witnessed over 150 young participants coming together to talk about mental health wellness in India through workshops, engaging activities and creative competitions across two days. The Aditya Birla World Academy hosted 20 schools in Mumbai where students of various groups across grades 8-12 engaged with the topic of mental health through varied academic and artistic media. This included dance movement therapy, street plays, photography, filmmaking, singing, research proposal poster competition and writing. This is part of the effort to remove the stigma associated with mental health so that more and more people can seek professional help. As anyone with experience in mental health issues -- patient, doctor, loved one -- knows, just beginning a conversation on the subject is the first, and most important, step on what is an often long and sometimes tricky path to recovery. The Girgaum centre in Mumbai throws its doors open to everyone. Given the stigma associated with mental health, they offer multiple avenues to reach their professionals -- phone calls, emails, online booking of appointments, even walk-ins. Through the twin initiatives of the centre and the foundations, Mpower has been able to reach about 600 families so far -- an encouraging statistic that portends well for the future. Neerja Birla now has plans to reach every university in the country to create awareness. Since charity begins at home, she is kickstarting the ambitious plan by starting a second MPower centre at the family-promoted BITS (Birla Institute of Technology) in Pilani. She also has plans to start a toll-free call centre to reach out to the rural population next year. Despite the enormity of the problem and the growing numbers of people who require mental health attention, one report suggests that India has only about 3,500 trained psychiatrists and even fewer psychologists. This incredible lack has made corporate philanthropists and even Bollywood celebrities take up the cause in recent years. Harsh Mariwala, promoter of homegrown FMCG major Marico, launched an online platform to promote awareness and encourage best practices in mental health on World Mental Health Day. Through its website, the Mariwala Health Initiative (MHI) will be sharing information and stories about mental health innovations, services, advocacy and expertise in India. MHI is also the principal funder for iCALL, a psychosocial helpline that offers counselling services over the telephone and email to individuals in psychosocial distress. Mariwala and Birla are doing quiet, serious, important work that is only just gaining awareness. Mental-health work is, after all, not a glamorous business. Which is why Bollywood actress Deepika Padukone's 'coming out' a few years ago about her own struggles with depression and search for positive mental health received wide media attention -- and was an important development in extending the mental health conversation. Her recently set-up Live Love Laugh Foundation espouses the cause of mental health in India, especially depression -- an endeavour that lifts the cloak of secrecy shrouding another taboo subject another important inch. Time for adolescents, young adults and parents of young children to find their voices too -- there's someone ready to listen. Is depression curable? Of course it is! Is depression a well-guarded secret in the start-up world?